The Buffalo Outer Harbor, located on the eastern shore of Lake Erie, and adjacent to the City of Buffalo contains hundreds of acres of the vacant former industrial landscape on the City’s waterfront. The Erie Canal Harbor Development Corporation (ECHDC) is in the midst of a multi-phase process reconnecting people to the powerful Lake Erie waterfront. The result will be a system of active public landscapes balancing ecological recovery and vibrant cultural attractions. As the prime consultant, TWMLA managed a large consultant team and worked closely with the client and stakeholder groups to define and execute the project. An iconic architectural beacon inspired by the local grain silos acts as a memorable contemporary wayfinding beacon for the site and as a ticket kiosk in the entry plaza. 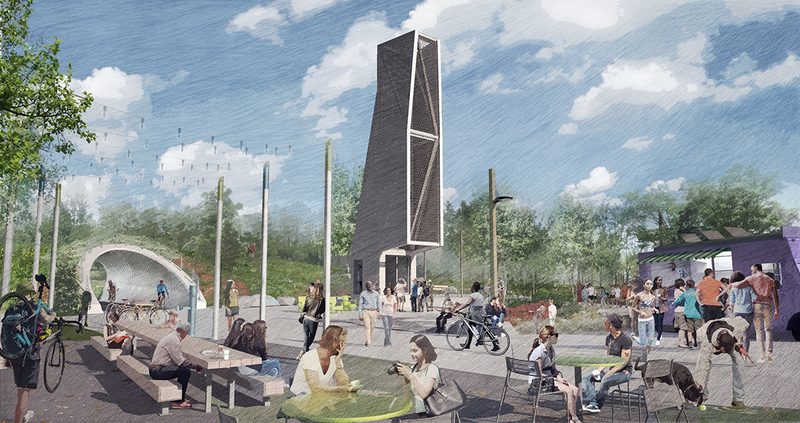 A flexible site design accommodates food trucks, vendors, bike rental, and festivals. Reclaimed building materials, new signage, and site furnishings establish a unified site aesthetic rooted in its context. Site stormwater is managed with a system of open planted infiltration swales and basins and will improve water quality in the adjacent restored Bell Slip. 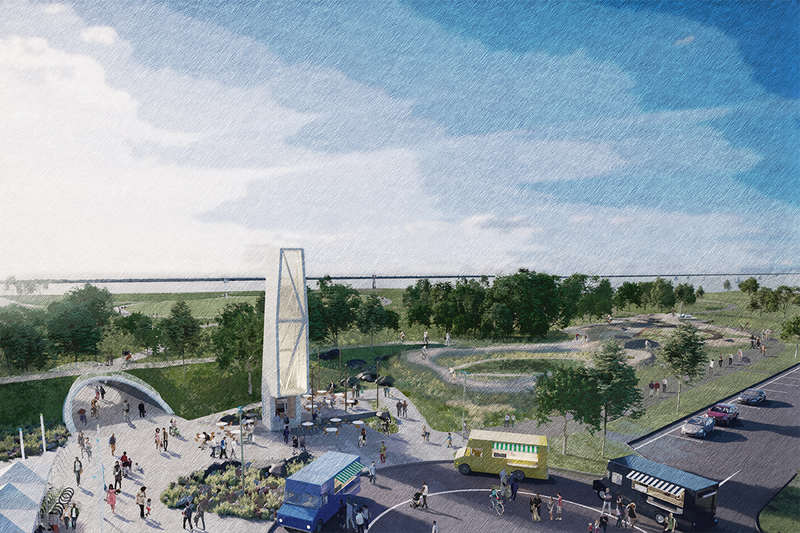 The Bike Park at the Outer Harbor creates almost two-miles of publicly accessible paved multi-use trail and dirt single track to offer new recreation opportunities to both passive and active users. TWMLA worked closely with national and local mountain biking advocates and designers to provide an exciting array of facilities to introduce the community to mountain biking. 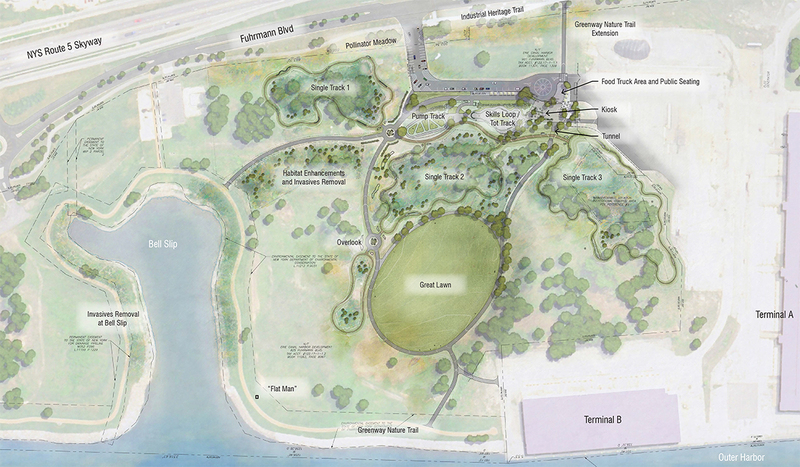 A broad event lawn reaches out to a future publicly accessible Terminal B and the Lake Erie waterfront. An active season of festivals and programming will be brought to the venue over the coming years, establishing it as a premier waterside destination in the region. ECHDC invested heavily in managing invasive species, reestablishing native plant communities, and creating deer-exclusion areas to promote landscape recovery targeting habitat restoration for migratory birds using the globally significant Great Lakes Flyway.